Royal Geoffrey, Celebrity Bicycle. » Twitter on your desktop in three lines of Python. Then a couple days ago a Mac OS desktop made the cut, alerting me to GeekTool’s revival. Apparently, GeekTool fell off when Apple went Intel and it’s taken them a while to get things back together. It’s a fairly simple BlitThingsOntoTheDesktop utility that gets the job done. Well. I wanted the date. My friend Dave wanted to see the date at a glance so badly he resorted to changing his system’s default date format to make the date appear in the menubar. Turns out it has a few icky consequences. So it’s settled. What will it take to get my twitter feed on my desktop? Turns out, fifteen minutes and about three lines of Python. That’s it. 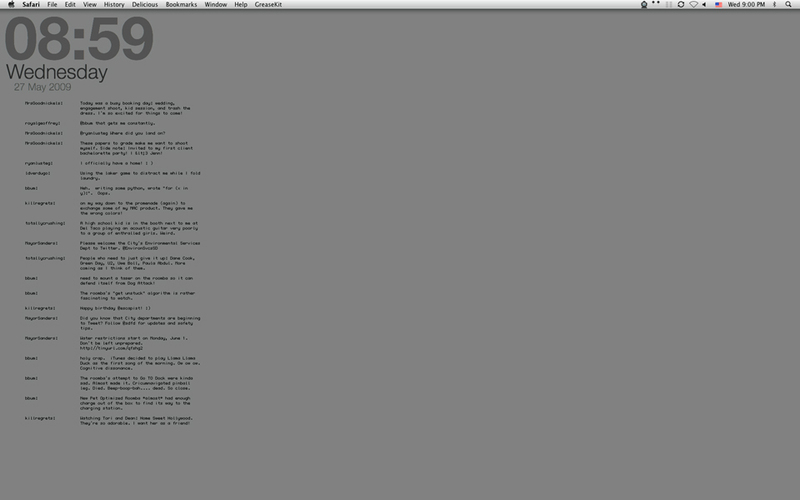 And really, most of the complexity there is in formatting the output nicely for display at the command line. Want it? Take it! Substitute your own username and password. You’ll need the python-twitter and simplejson modules. Then set up a GeekTool shell command to run python ~/royalgeoffreycelebritybicycle/twitterfeed.py (assuming you copy the above python source and save it to ~/royalgeoffreycelebritybicycle/twitterfeed.py). I dig it. Beats refreshing the website every time I get bored, or running yet another app that eats up screen real estate. At any rate. If you’re not versed in dealing with Python modules, and the like.. don’t fret. There’s more coming. Big Plans. Keep watching. I’ll be rolling out some nicer, cleaner, prettied-up stuff based on this idea in the near future. This entry was written by admin, posted on May 27, 2009 at 9:54 pm, filed under projects, software and tagged lifehack, programming, projects, python, software, tools. Bookmark the permalink. Follow any comments here with the RSS feed for this post. Post a comment or leave a trackback: Trackback URL. I knew someone would copy conky and the mac fan boys would get boners. Good works, looks great!